Aquafirst’s powerful suction motor vacuums up all debris large & small and deposits them in its own filtration bag. The unit filters 4,500 gallons of pool water per hour and removes dirt, debris and even algae. Powerful brushes on the front and back of the cleaner scrub away stubborn dirt and algae from your pool’s surface. Since Aquafirst™ has its own filtration system it reduces the load on your existing pump and filter system while it distributes heat and chemicals as it vacuums. Running at a safe, ultra-efficient 24 volts, these robotic cleaners run on pennies per day of electricity. 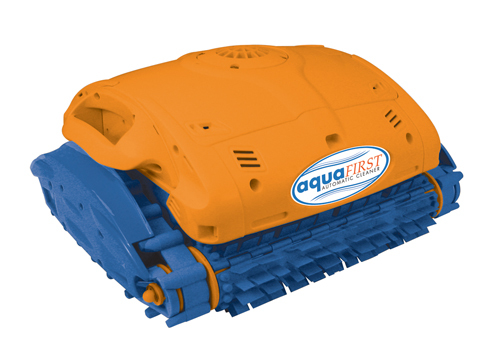 The pre-programmed Aquafirst™ cleans your pools floor, steps and walls up to 30” above the floor in 2 hours & automatically shuts itself off when its work is done. Patented NeverStuck™ rollers keep the unit from getting stuck on raised main drains and in-floor fittings. Designed for residential pools up to 20’x40’, the unit comes complete with cleaner, 50 feet of floating cord and transformer. Aquafirst™ is lightweight – 17 lbs – and easy to lift out of the pool. UL & ETL listed. 1-Year Warranty.